Visual Studio notified me that using WCF is not permitted in the starter edition of Xamarin. I needed to login and buy the Business Edition. Then I found the beginning a xamarin trail in the developers guides. 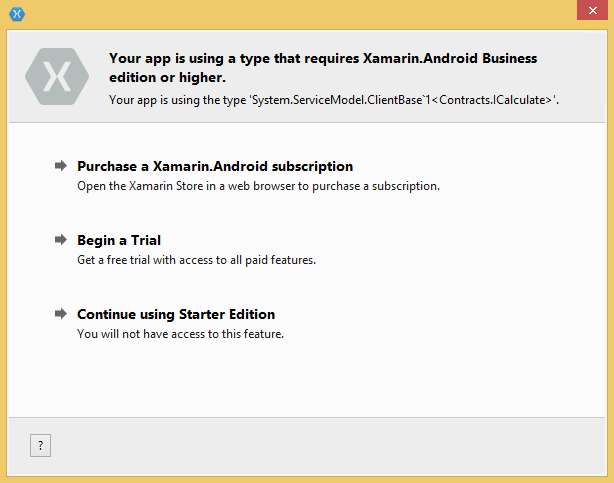 Just login or create a xamarin user and start the trail right from the popup. This entry was posted in Tooling and tagged visual studio, Xamarin. Bookmark the permalink.